I've not been able to bake a lot over the past couple of weeks as I've been working away a lot. I've really been missing my kitchen, especially as it's National Baking Week, so a friends birthday party was a great excuse to get back! She's a total chocoholic so I decided to make a marble cake with chocolate icing. For the marble cake I made 10oz of batter in total, 6oz of chocolate and 6oz of vanilla and put white chocolate chunks in the vanilla and dark chocolate chunks in the chocolate. I also added a little soured cream to ensure the sponge was lovely and moist. I baked it in two 8" cake tins. 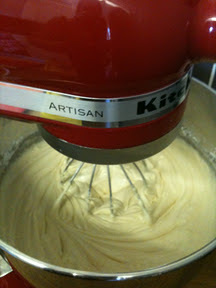 I'm so pleased with my new Kitchen Aid and the texture of the batter really is better. For the icing I made a basic butter cream and added plenty of melted dark chocolate and another spoonful of soured cream. I sandwiched about 4 tablespoons between the two layers and then smoothed a crumb layer over the whole cake (a thin layer of icing to keep any crumbs in) and then used the palette knife to put plenty of icing around the sides. 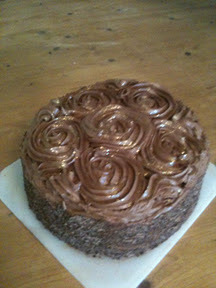 For the top I used a star nozzle to pipe circles (as though I was topping a cupcake) to resemble roses. I did the ones around the outside first, using a small blob of icing to fill in the gaps and then finished with one in the centre. Finally I sprinkled a little gold glitter all over the top and pressed chocolate shavings all over the sides. The cake looked especially lovely when the candles were lit as they made the glitter look even more sparkly! 2. Start by making the vanilla sponge (that way you don't need to wash the bowl in between mixtures). 5. Place one blob of mixture in the centre of each cake tin and then four blobs around leaving a gap between each for some chocolate mixture. 6. In the same bowl cream 6oz butter with 6oz caster sugar until fluffy. Add the 3 remaining eggs one at a time. 9. Bake for 35-45mins until a skewer comes out clean. 10. While the cake cooks make the icing. Start by beating the butter until smooth and the gradually add the icing sugar. Finally stir in the soured cream and slightly cooled melted chocolate. 11. Once totally cool ice the cake as detailed above.